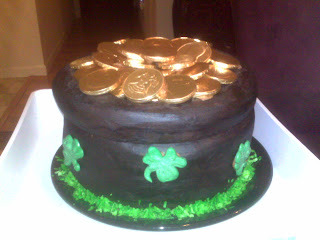 Last night I went to Irish themed potluck in honor of the upcoming St. Paddy's Day. It was a group of Meetup people that have a love of food and like to do a themed potluck each month. It was great meal! Sure there was corned beef and cabbage, but not the way you're used to. PJ made a soup made with cheddar, beer, potatoes, and onions. It was nice because it was not too thick and she didn't puree it completely - it still had some chunks. Anika was in charge of the corned beef and we were all glad she was. Forget the traditional treatment! After boiling the beef, she took it out and glazed it with a sweet, homemade barbecue and then baked it in the oven for a couple hours. Barbecue sauce on corned beef? Let me tell you, I think she converted the entire group. After all, you've got all the side dishes as well. Melodee made two dishes. The first was colcannon, an Irish take on mashed potatoes that mixes in chopped kale. Peel and boil the potatoes. Chop the kale or cabbage fairly small, discarding the large stems. Steam until tender, about 8 minutes. Gently saute the onion (if desired) until golden but not too brown. Mash the potatoes well, and mix with the kale and onion. Add the milk (not too much, until moistened but not wet), and the butter, salt and pepper to taste. Bake in a medium oven for about 15 minutes. She also made the cabbage, but created a version that was another hit. She took shredded cabbage (the kind you buy for cole slaw), added julienned carrots, and then added seasoning. I'll have to ask her what that was. You can see her two dishes on the right side of the plate. I made a potato torte with bacon, cabbage, and cheddar. I got it from Irishabroad.com which had a LONG list of Irish recipes. (This compared to many other sites that only had a handful of the common stuff like colcannon, Irish stew, and soda bread.) The torte was made in layers, like a lasagna - potatoes, cabbage, cheese, potatoes, cabbage, cheese, potatoes. It was a very nice side and I will definitely make it again as a regular St. Paddy's dish. It doesn't hurt that it uses the bacon drippings to coat the potatoes. In a pot of boiling water, blanch the cabbage for 2 minutes. Drain and refresh in cold water. Pat dry. In a large skillet over medium heat, melt the butter. Add the bacon and cook until browned, about 5 minutes. With a slotted spoon, remove the bacon and toss with the cabbage. Add the potato slices to the skillet and toss to coat in the bacon drippings. Place one-third of the potatoes in the bottom of the prepared pan. Sprinkle with salt and pepper and half the cheese. 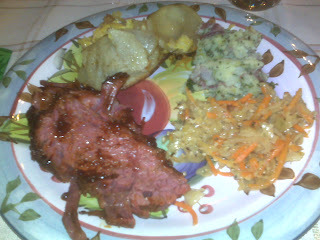 Top with half the bacon and cabbage mixture, salt and pepper, then repeat with one-third of the potatoes, remaining cheese, bacon and cabbage, salt and pepper, and end with a layer of potatoes. Cover with a sheet of parchment paper and bake for 45 minutes. Remove parchment for last 5 minutes to let potatoes brown. Slice into wedges. Serves 8. inutes. Gently saute the onion (if desired) until golden but not too brown. Mash the potatoes well, and mix with the kale and onion. Add the milk (not too much, until moistened but not wet), and the butter, salt and pepper to taste. Bake in a medium oven for about 15 minutes. The host, Theresa, made chicken and dumplings. That was wonderful as well. The sauce was thick and creamy and filled with delicious dumplings. It reminded everyone what a great comfort food chicken and dumplings are. She also made an applesauce/beer cake with a lemon glaze. It was a dense cake with raisins and nuts. People commented that it would be a great cake during the holidays, like a better, edible type of fruitcake. The cake at the top was made by Anika. Impressive for someone who hasn't taken a cake decorating class. It is four layers of cake which she carved and iced. She then used spray food coloring to get the black. Great job! This was my first potluck with this group and I was impressed. I'll have to join them more often.